On Saturday morning, October 14, 2017, more than 3 dozen Chapter members and their friends gathered at Grosjean Park in Wooster to stock over 450 rainbow, golden (a rainbow strain) and brown trout in a half mile stretch of Apple Creek. At the same time litter was picked up and removed from the stream and stream banks. That afternoon, members served as gillies to teach novice and beginning anglers how to fly fish. 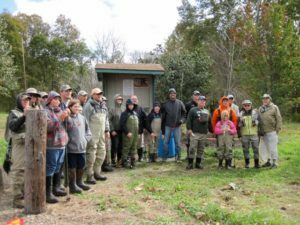 Twenty-six kids and adults learned how to cast a fly line, fish Apple Creek, and for most, how to hook, play, land and release the trout they caught. The trout seemed to have a case of “lockjaw,” not readily willing to chase flies cast to them. However students did learn the basics of rigging a fly rd and casting a fly line, and a few lucky students caught and released their catch. We appreciate the financial support provided by a grant from the Ohio Division of Wildlife Aquatic Education program, and as always, cooperation and support from Parks and Recreation of the City of Wooster. The fish stocked in the stream are now proving wonderful fly fishing opportunities for anglers who are arriving at Grosjean Park in big numbers from all over northeast and central Ohio. We especially appreciate that virtually everyone we have encountered is practicing catch and careful release. Past experience has proven that this practice sustains the fishery over the winter, spring and into the following summer months. Visit the members pictures page on the site for photos of the stocking and fly fishing clinics.